Glossary of Outdoor Fireplace Terms: Study this quick guide and sound like a pro! Photo by Dallas Outdoor Kitchens. As part of the overall design mix, the dimensions and scale of your outdoor fireplace play a crucial role. The ambiance of a warm fire can be lost if the fireplace is too small or weak. The glow of a flickering flame can be overwhelming if the fireplace is blazing like a bonfire. Focus on how the fireplace will be used"The size should be determined by the number of people expected to be able to use the fireplace at any given time," says Larry Gucciardo, owner of Dallas Outdoor Kitchens. With 15 years experience designing outdoor kitchens, residential swimming pools, patios, and more, Gucciardo judges the size of outdoor fireplaces by space constraint at the jobsite, budget, and how it will be used socially. "Large groups of people will require a grander scale as people tend to gravitate to the front of fireplaces, especially in cooler months. For large groups of people, you might even consider two fireplaces at opposite ends of each other to help distribute the volume of people over a larger area. For more private settings, I believe it just needs to be determined by how it will be used socially and scale it to match its surroundings," says Gucciardo. 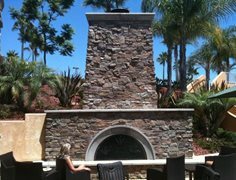 As a post on ConcreteNetwork.com's Facebook page, this photo of a fireplace at Panera Bread in Solana Beach, Calif., garnered many comments about its massive size. "It's definitely not "intimate" and inviting..." commented Jacqueline Bay. "I think it is beautiful...attracts attention," Debra Caldwell Haskin-Harris remarked. Others noted that it would depend on whether a proportionate fire could be built in it to still provide comfort. Another interesting point was that the size of the building it is next to (not shown in the photo) would help determine if the fireplace was too large. Regarding this Panera Bread fireplace, Gucciardo states, "For a restaurant or other public facility, I think the fireplace needs to be on a much larger scale than a typical residential one so that it can benefit a larger group of people at one time." Types of fireplaces impact sizeNot only will budget and the size of the location for the fireplace be important to consider, but the type of fireplace will have implications as well. A chimney will increase the size of a fireplace by as much as two additional feet. Wood-burning fireplaces are typically taller because a chimney is required. In most areas, city permits require a chimney to rise two feet above nearby structures. Gas-burning fireplaces, on the other hand, don't need a chimney at all, and can be much more conducive to a smaller, more intimate style. Judge scale by surroundingsFor an outdoor fireplace to blend and become a natural-looking part of an outdoor area, its scale must balance with its surroundings. "A small fireplace would look out-of-place in a very large area," explains Gucciardo. 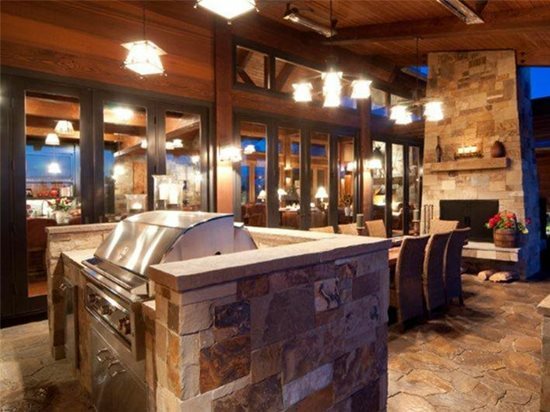 "I personally like to build fireplaces and incorporate kitchens, BBQs, or pizza ovens into them. They make for a grand statement." A general rule-of-thumb: If you're looking for ambiance—go small. If you're looking for a focal point or an anchor to an outdoor room—go large.